Garlic was worshiped by the ancient Egyptians, chewed by Greek Olympian athletes and thought to be essential for keeping vampires at bay! It also said to work wonders for your love life, being good for zapping bacteria, keeping your heart healthy, and warding off coughs and colds. Garlic is, of course, best known as a cooking ingredient used for its wonderful taste. It would actually be better to say “tastes” plural since it can take on a completely different taste depending on how it is cooked – everything from a subtle sweet flavor to a strong almost overpowering one. But do not worry, it needn’t give you bad breath – chewing raw parsley is often recommended to help reduce the smell. Many people grow it themselves – it is easy and fun, even if you are not usually much of a gardener. Garlic (Allium sativum), is a member of the onion family, which also includes leeks, shallots and onions , but differs from onions in form as well as taste. 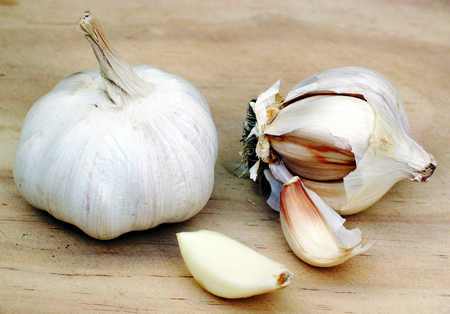 Instead of one large bulb, garlic produces a dozen or so small ones called cloves, surrounded by a thin, papery skin. Individual cloves act as seeds. The bulbs grow underground and the leaves shoot in to the air. Although it is traditionally thought of as a Mediterranean ingredient, it is also grown successfully in colder more Northern climates. 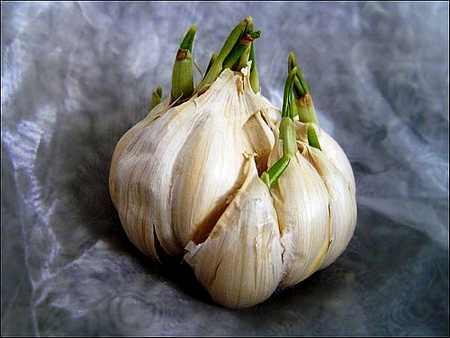 The way to get good garlic bulbs is to grow lots of leaves before bulb development. The more foliage developed, the better the resulting bulb, in both size and quality. The trick is in the timing of the planting. Garlic is not fussy and can be planted in late fall, winter, or early spring, however, fall planting is best if winters are not severe. The garlic needs to go through a cold spell if the head is to develop well, so what better way to guarantee that than planting in November? Leaf development happens during the short, cool days of early spring. Long days and higher temperatures favour bulb development and, once the bulb starts to form, no more foliage is produced. Obviously then, it is important to plant very early in the year to establish a large vegetative plant. Choose a site that is open and sunny with a fertile, well-drained, light soil – heavy clay soil creates misshapen bulbs and makes harvesting difficult. If the soil is heavy, either add sand so as to aid drainage or plant in raised beds. 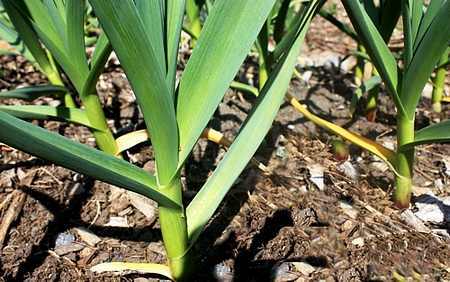 Garlic do not require a soil high in nutrients, so are ideal to follow a summer crop that has just finished and been lifted. 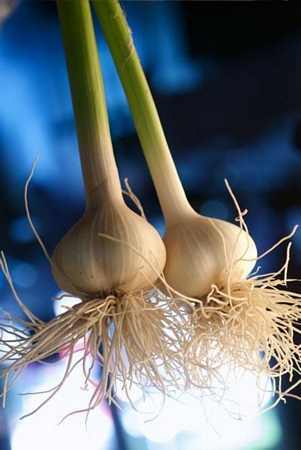 When choosing garlic to plant, look for bulbs that are healthy and firm. You can, of course, buy special virus free bulbs, but most bulbs from the supermarket will work fine too. Select only larger, outer cloves to plant. Be sure they are smooth, fresh and free of disease. Do not divide the bulb into cloves until you are ready to plant, as early separation may decrease yields. Then split the bulb and plant the individual cloves 15–18 cm (6–7 inches) apart, in rows spaced 30 cm (12 inches) apart as a guide. The closer the planting, the smaller the mature bulbs tend to be. Plant the cloves straight with the flat base down into the soil to a depth of twice the length of the clove, plus 2½ cm (1 inch) of soil above the clove. This will give the garlic plenty of soil to grow in, since they tend to push upwards, and it should also help increase your yield. Garlic must be kept evenly moist, as dry soil will cause irregular-shaped bulbs. It does not have a very extensive root system, so watering is essential. 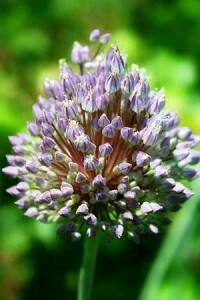 As hot weather approaches, garlic plants may begin to flower. Remove flowers as they appear. You will know when the garlic is ready to harvest because the tops turn yellow and start to dry out. Once more than half of your crop has done this lift them all gently with a fork, remove any excess soil from the hairy roots and leave them somewhere to dry thoroughly (until the skins become papery). Hanging them up in a cool, dry, well-ventilated place is the best way. Tops and roots can be removed with shears to within an inch of the bulbs, or the tops can be braided together after bulbs are completely dried. In the East, garlic’s fresh green leaves are often used to flavour foods as the taste is so much more subtle than the cloves; they are especially good in salads. Mature bulbs are best stored at cool temperatures (5-10°C) in a dry place. If they are too cool, they will sprout and, if too moist, they will grow roots. 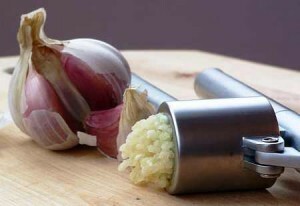 Do not store garlic in the refrigerator, as it will not store long and will soon sprout. When you harvest all that garlic next year and aren’t sure how you will use it all, just walk by a good Italian restaurant – the delicious smell of garlic is sure to inspire you! An essential element in cuisines around the world, garlic enjoys near mythic status among cooks, chefs, foodies, and enthusiasts of natural remedies. Worldwide, cultivation occupies over 2 million acres of farmland, an area that has more than doubled since 1970. 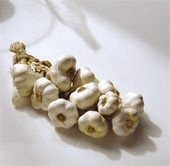 Yet even garlic fanciers may be unable to tell hardneck from softneck, or Purple Stripe from Rocambole, not to mention the hundreds of cultivated varieties grown today, many with distinct differences in taste and character. In fact, the wealth of varieties in nearly a dozen horticultural groups rivals that of corn, carrots, apples, and peaches. This book is the most comprehensive and in-depth guide available to what surely should be the next gourmet frontier. From ‘Ajo Rojo’ to ‘Zemo’, Meredith presents illustrated profiles of nearly 150 cultivars. Detailed chapters cover natural history, the history of garlic in cultivation, the nuances of cuisine and culture, therapeutic benefits, plant structure, how to cultivate, curing and storage, taxonomy, pests and diseases, and chemistry. Especially useful are the Quick Guides, which summarize information on growing and buying and provide recommendations for the best-tasting cultivars for specific uses and climates. Lists of garlic sources and organizations are a boon to the aficionado. Whether you share Ted Jordan Meredith’s ‘garlic affliction’ or just find the pungent bulb indispensable, you’ll understand it as never before with this meticulously researched, lovingly written exploration. It was worshiped by the ancient Egyptians, chewed by Greek Olympian athletes and thought to be essential for keeping vampires at bay! It is also said to work wonders for your love life, being good for zapping bacteria, keeping your heart healthy, and warding off coughs and colds. 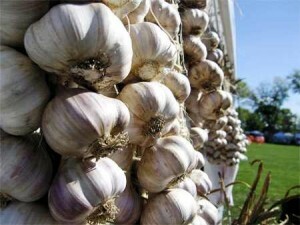 Gardening in Spain Garlic best known as a cooking ingredient used for its wonderful taste.